We hope you’ll humor us as we write our second “we have the best customers on earth” post but really . . . we do. We have met the most interesting, kindest, friendliest and sincere people since we began this mission of bringing Amish Quilt art to as many folks as we can. Living in the northeast, we spent the last two days anxiously anticipating the big blizzard and accompanying 30 inches of snow – which thankfully did not materialize. Another of our clients lives further north and is experiencing the same weather pattern so we were happy to hear from her yesterday. Even happier to see the photo attached to her email. We met Nancy and Tom over the summer when we stayed at their bed and breakfast, Best Kept Secret B and B. Nancy also owns and operates a custom sewing business, Tom Cat Designs. As you can imagine, there was much to talk about . . . and we did . . . talk a lot! We learned that the Double Wedding Ring Quilt pattern was Nancy’s favorite quilt pattern. A few months after we returned from our vacation we left again for Amish country and low and behold, we picked up a Double Wedding ring quilt and of course, forwarded photos to Nancy and Tom. Nancy immediately purchased it and uses it in one of the guest rooms in their bed and breakfast. 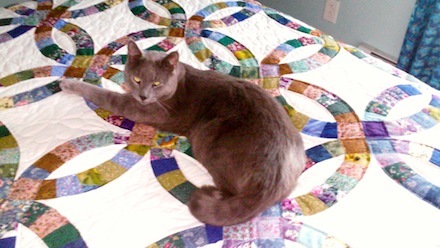 Yesterday, we received this photo of Gandolf the Cat luxuriating on what looks like he has assumed is his very own Amish quilt! Thanks again Nancy and Tom! Just before the holidays, a package arrived from Jan. In it we found the two bags you see in the photo. We love Jan! This is our second set of bags from her. She makes them and sells them via her on line store Aurora Light Design. Really versatile bags with mesh bottoms – which is great for use at the beach (keeps us from dragging half the sand into the car with us). This time we were so excited to see the name of our company on one of them – Jan’s idea was that if we carry around a bag with “Amish Spirit” written on it, we can sell more Amish quilts to more people. At the very least, start a conversation about Amish quilts. We think Jan is great – and so are these bags! 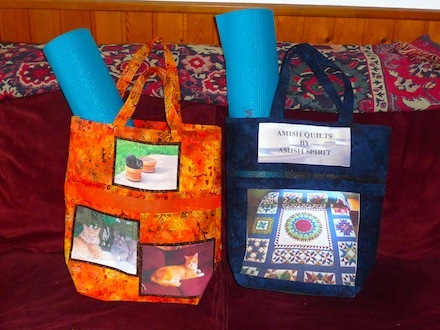 We put a yoga mat into each bag so that you can see get the general idea of the size and overall capacity of each bag. She also kindly made a second bag by pulling Facebook photos of our family pets. Really really ingenious don’t you think? Best sure to check out her Etsy shop HERE. Jan makes many beautiful things. These useful and attractive bags are just one example.